Oh but this was good. Really, really good. Un-putdownably so. I read it over two days whilst off work sick and it got me through that horrible "before the drugs kick in" section of recovery in a blur of awesome. 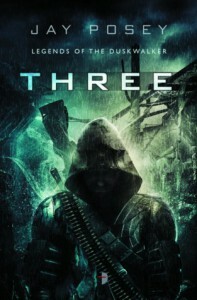 Three is a brilliantly dark and dangerous Post Apocalyptic novel set in a broken world. Posey gives absolutely nothing away, which is the part that you're either going to love or hate. As a reader, I absolutely love it when authors throw you in at the deep end. I'm not one for long, detailed info-dumps and am a life-long fan of the organic approach to world-building. Which made Three perfect for me. Those of you who like your background work covered first, may struggle here. You should definitely still give it a go though, follow Three, Cass & Wren, stay close to them and try to stay safe. Get ready for a lot of running. Books that carry a heavy element of 'running away' can often get samey and predictable. Three doesn't fall into that trap. Posey knows just when to break things up with the introduction of fresh menace, and when to dangle a juicy tidbit of world knowledge in front of your nose. And when you feel almost physically tired from trying to keep up with Three & Co. he brings you into Greenstone and lets you rest up with some kind and gentle souls. Albeit briefly. I don't even know how to describe what Posey does in a way that will do the book justice. It's as if...your journey through the narrative is perfectly, absolutely controlled at all times, and yet when you're reading, it feels like the opposite is true. You feel lost in the narrative initially, but you never are, and it's not until you reach the end that you see. Three gets its hooks into you immediately, but once you're on board a hundred tiny new hooks work their way in, and when you finish it...each of those little holes stings and reminds you of an aspect that you want to know more about. I am somehow, literally, itching for the next in the series. I try to not go anywhere near spoilers in reviews. So in the very vaguest of terms I'll say that the relationship between Cass and Wren was one of my favourite aspects of the book. As Mum to a young boy myself, Posey had my eyes leaking at one point. Couple that with the tech element to the novel, and you have two diverse, hugely effective aspects that instantly catapulted this into my top five PA novels of all time. If I had to make any kind of complaint, it would be that I wanted a deeper layer of detail on the tech front. Almost at code level. But then, I'm an extremely greedy reader. And on that note (code, not greed) Three reminded me a lot of Barnes' Artificial Evil. They both share that Mad Max feel with code running centrally and visibly through the narrative. I'd hazard the recommendation that if you've enjoyed one, you'll enjoy the other. Lastly, grey-area heroes, is there ever anything more interesting? Killers, addicts, liars, runaways. All capable of noble beauty in their own way. I adore this book.